The boycott of SodaStream, which has cost the firm losses in the past year, has raised questions over whether Palestinians employed at the Israel-based factory are feeling the pinch. 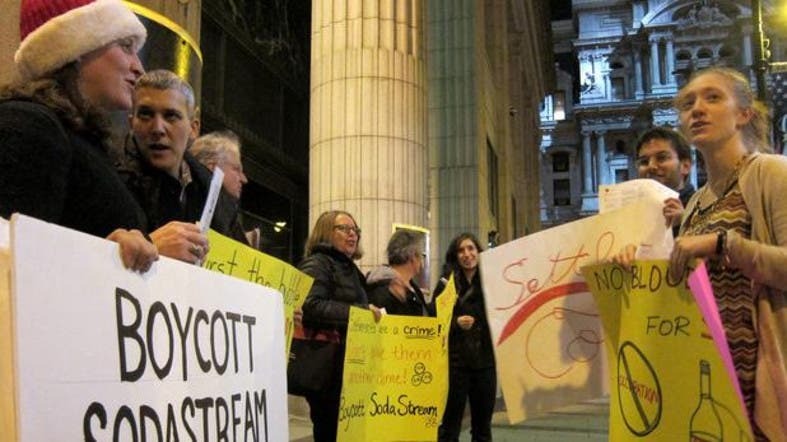 The Boycott, Divestment and Sanctions movement has defended the boycott of SodaStream - a maker of home carbonation machines - despite the move possibly impacting Palestinians working at the company’s factory. “SodaStream has always been a target of the BDS movement, and has developed into a major campaign since late 2011,” a BDS spokesperson told Al Arabiya News. “We reject any suggestion that the reality that Palestinians are sometimes left with no choice but to work in illegal Israeli settlements is a reason not to take action to end international complicity in human rights violations,” the spokesperson added. SodaStream has 20 factories around the world, one of them based in the West Bank settlement of Mishor Edomim. Around 900 Palestinian workers are employed in the West Bank plant, The Jewish Telegraphic Agency reported last year. SodaStream’s CEO Daniel Birnbaum appeared in a video uploaded in Dec. 2012 stressing the benefits Palestinian employees receive. “We give them an opportunity to not only have a job and health insurance, but also social benefits and a very high pay scale which they could never achieve in the West Bank,” Birnbaum said. The article interviewed sources working at SodaStream’s West Bank plant, but only introduced them through their initials. Those interviewed said the video is “clearly part of SodaStream’s public relations campaign,” as its release coincided with the launch of the boycott campaign in the United States. “I feel humiliated and I am also disgraced as a Palestinian, as the claims in this video are all lies. We Palestinian workers in this factory always feel like we are enslaved,” M. said, adding that the employees were not aware of the boycott campaign. The BDS movement, launched in 2005 and coordinated by the Palestinian BDS National Committee, urges various forms of boycott against Israel and Israeli products. It is a global movement petitioning against the Israeli occupation of Palestine. The campaign employs several boycotting methods, including “online advocacy, protests at stores that sell SodaStream, and urging shareholders to sell their shares in SodaStream,” the BDS spokesperson said. Some retailers in Italy and elsewhere have already stopped selling the Israeli product as a result. SodaStream presented lower-than-forecast preliminary results for 2013, with shares plummeting since the release of its third-quarter results, Bloomberg reported last week. The company said discounts and higher costs of production, as well as slow sales over the holiday season in the United States – one of its major markets – were factors driving the drop. Al Arabiya News contacted SodaStream several times for comment on the boycott and the dismal financial results, but there was no reply. Earlier this month, SodaStream said movie star Scarlett Johansson would be its celebrity brand ambassador. She will be featured in a TV commercial due to be aired during the U.S.
Super Bowl game in February. The collaboration has attracted criticism on social media. “It was very surprising that Scarlett Johansson has decided to become the new face of Israeli apartheid, especially given that she is also an Oxfam ambassador,” said the BDS spokesperson.